VATICAN CITY (CNS) — Only the repentant heart that is humble, open to correction and trusts completely in God will be saved, Pope Francis said. Those whose hearts are proud, self-righteous and deaf to God’s voice and correction are doomed, the pope said Dec. 16 at his morning Mass in the Domus Sanctae Marthae, where he lives. “The people who are humble, lowly and trust in the Lord, they are the ones who are saved, and this is the way of the church, right? It has to go down this path, not the other one, which doesn’t listen to the voice (of God), doesn’t accept correction and doesn’t trust in the Lord,” he said, according to Vatican Radio. The pope’s homily focused on the day’s readings, first from the Book of Zephaniah (3:1-2, 9-13), in which the Lord condemns the “rebellious and polluted” city, which does not hear or trust in God and accepts no correction. God will remove “the proud braggarts” and leave behind “a people humble and lowly,” the reading says. The Gospel reading from St. Matthew (21:28-32) shows Jesus asking the chief priests and elders to decide who is more obedient to God’s will: the son who refuses, but then repents and goes as commanded to work in the vineyard, or the son who agrees right away but does not go. 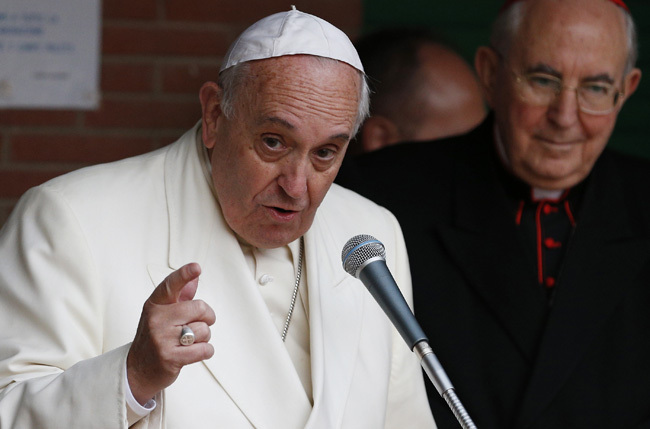 The two readings, the pope said, talk about judgment, salvation and condemnation. The Gospel account of the two sons, he said, can be seen today with Christians who declare that they are “pure” just because they go to Mass and receive Communion. But God wants something more, the pope said. He wants them to honestly open their hearts and courageously lay bare all of their sins. Even people who generously give their lives in service to others, who work with the poor, help the church, there is still something missing that God wants: a list of their sins, the pope said. “When we are able to tell the Lord, ‘Lord these are my sins, not the sins of that one or the other, these are mine. They are mine. You take them and that way I will be saved’ — when we are able to do this we will be that beautiful people, a humble and lowly people, who trust in the Lord,” the pope said. Among those invited to attend the morning Mass were the three women religious from the United States who were in Rome for the presentation of a final report ending a Vatican-ordered investigation of U.S. communities of women religious. The Vatican’s final report calling on the women to discern how best to live the Gospel in fidelity to their orders’ founding ideals was “very pastoral,” she said. “It challenges each of us, every one of our congregations, to turn all of that over to Jesus so that he can work great things through us, and I think that was the message I received from the Holy Father this morning,” she said.